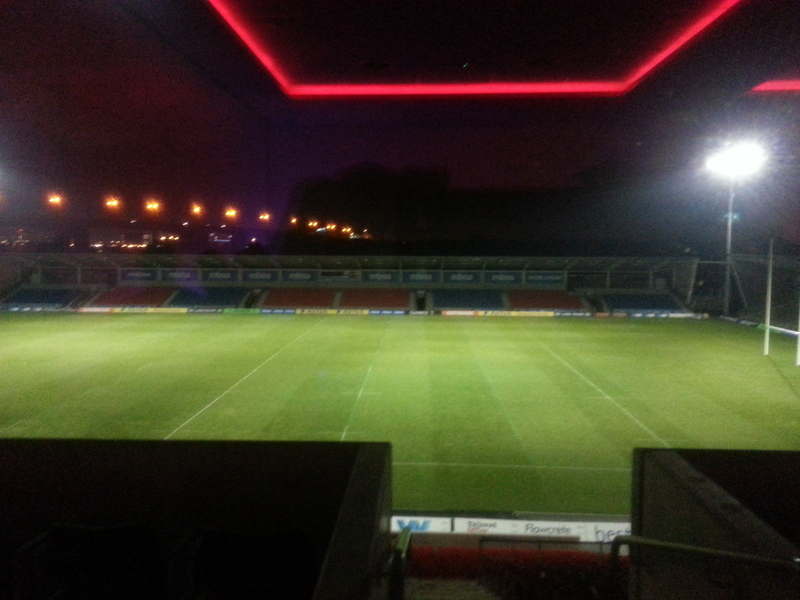 17th November ’12 – Hired as wedding DJ for Mr & Mrs Oldham who were celebrating at the Salford Reds Stadium in Eccles. They had actually got married in Las Vegas but threw this party back home for guests who couldn’t make it. Saford Reds Stadium is a new building offering great modern banqueting facilities overlooking the pitch. Fab for wedding parties & other celebrations. They had approx 170 guests, some of whom were rugby players who can make for quite rowdy party goers, but it was all good fun! The bride (Sam) who’s maiden name was Ferrari, told me she didn’t really like the idea of changing from Ferrari to Oldham! But she did it so I guess it must be true love! So, we had casino tables & chocolate fountain running from the start of the evening (which I’ll mention in the next couple of posts). The buffet came out around 8.30pm & I played warm up disco through till 9.50pm. 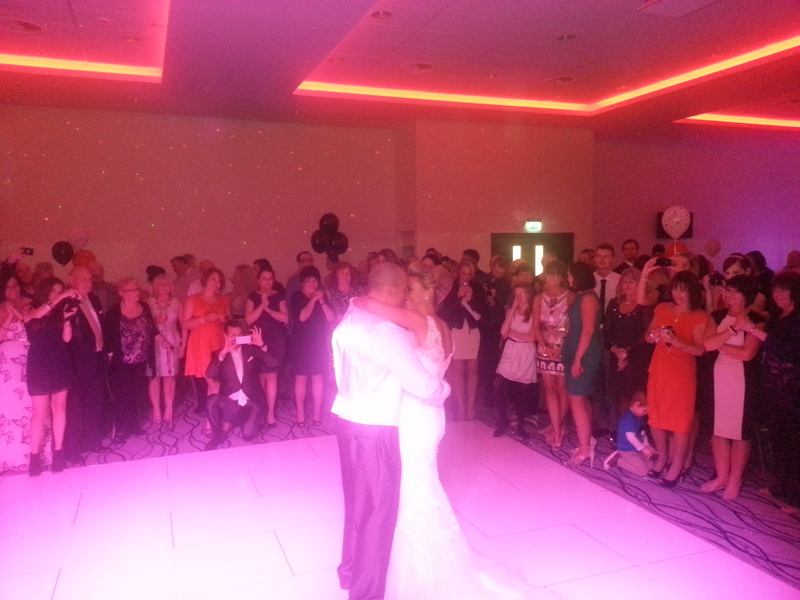 We then rounded everyone up & invited the bride & groom to perform their first official dance as man & wife. They danced to Michael Buble ‘Everything’. However, before we got to the end of the song, it was time for Elvis to make an appearance! Sam had booked an Elvis tribute act as a surprise for the guests. 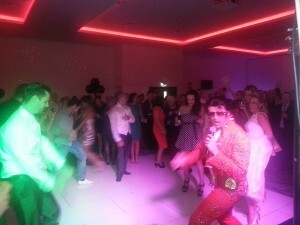 He took over from the first dance & performed a 1 hour set of Elvis’s biggest hits which went down a treat! Tribute acts can be great fun live entertainment for wedding parties, especially if you’re having a bit of a theme such as Vegas in this case. Elvis has crashed the party! After Elvis, it was time for the main disco. 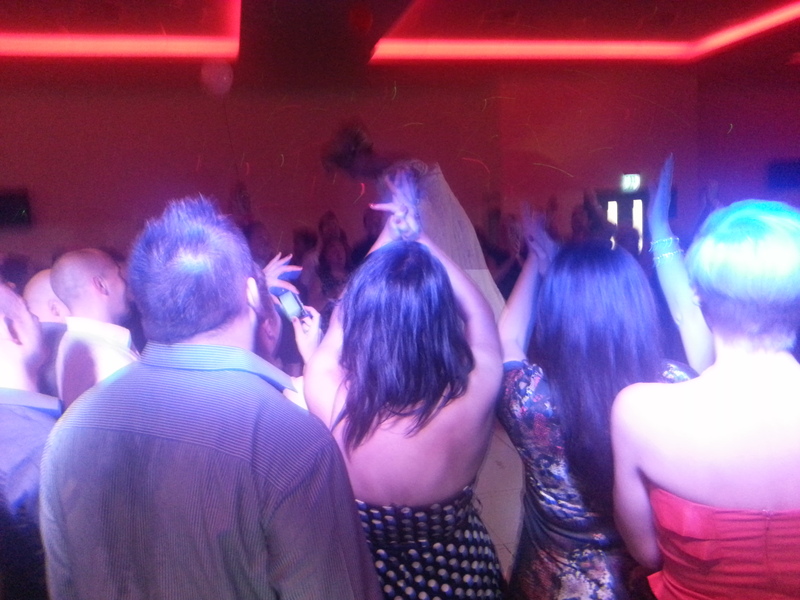 Packed dance floor the whole night, mostly current chart but a few classics thrown in too & some great moves from the bride & groom to Dirty Dancing! All the best to Mr & Mrs Oldham! Just wanted to say thanks for last night it went perfectly and we loved it.